These letters were written by 25 year-old Sgt. 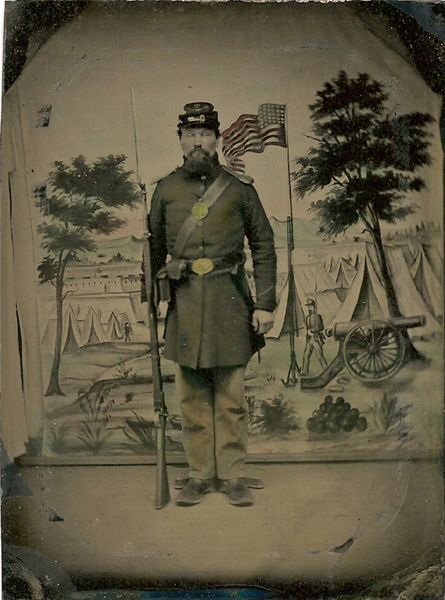 James M. Young (1838-18xx) of Co. I, 115th New York. 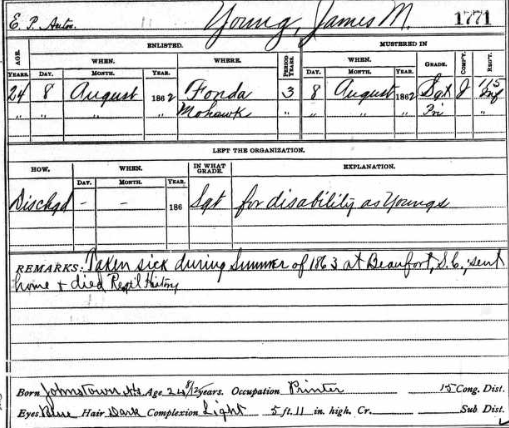 Regimental records indicate that James was born in Johnstown, New York; that he stood 5 ft. 11 inches, had blue eyes, dark hair, and a light complexion; and that he was a printer by trade when he enlisted. It also states that he was taken sick during the summer of 1863 at Beaufort, South Carolina, discharged, and sent home to Johnstown to die with his widowed mother, Lydia (Coffin) Young (1815-1891), the daughter of Elisha Coffin and Sarah Scoville. James’ father, Harvey Young, died when James was only ten. The 115th New York had a rather inauspicious start to their three-year term of service. The “Iron Hearts” — as they were called — were organized at Fonda, Montgomery County, and mustered into service on 26 August 1862. But less than three weeks later, the regiment was surrendered with other troops at Harper’s Ferry to Gen. Stonewall Jackson’s Corps who took the town with little or no resistance on their way to Maryland (prior to the Battle of Antietam). After being paroled, the 115th New York proceeded to Camp Douglas, Chicago, by way of Annapolis and Baltimore, to await exchange. Following exchange, the regiment was sent to Hilton Head and Beaufort, S. C., until ordered to Florida in the latter part of January 1864. I wrote you only a few lines by the last mail, but the boat going sooner than I expected gave me an opportunity of writing a short letter; just enough so you could say you had heard from me, and informing you of the arrival of your letters. You want a description of Hilton Head. You are well aware it is situated at the mouth of Port Royal entrance. It is an island 12 or fifteen miles in length by 8 or 10 miles wide, and formerly belonged, I believe, to a general in the rebel army by the name of Grafton.¹ His residence is but a short distance from our camp, and though not a stylish or handsome building, is a splendid place. The grounds have been laid out with care and taste, showing that the owner had an eye for the beautiful. By deserting his government he has lost it all. Lieut. [Francis D.] Barnum with 5 or 6 others and myself were out on a short stroll the other Sunday and saw where the “cotton picking'” had once been going on. The wood is mostly yellow pine and palmetto; and palm leaf, such as our palm leaf fans that are used so much at home are made of grows in any quantity. The buildings composing the place are all government buildings or sutler establishments and is about as large as Caughnawaga or a little larger. Fort Walker is on this side and Beauregard on the other [side of the sound on Phillips Island]. Beaufort is about 25 miles above. What would you think to see trees in full bloom in February? I suppose you would incline to the Millerite persuasion and believe the millennium had arrived and that it required only one slight brush to take the world out of existence. But trees are in bloom here and nothing is thought of it. The soil is sandy and drifts like snow, though not in such large heaps. There is also a good deal of swamp. I have seen what has been called pleasant winters at home, but none to compare to the one I am now experiencing. Think about throwing off your coat and sitting in the shade in February to keep cool. You are no doubt putting on overcoats and sitting by the fire to keep warm. I have only seen about an inch of snow this winter and that was while at Washington. Now, while writing this letter, I am sitting in my tent with coat and hat off, and undergoing a sweating operation equal to a first-class thunder shower in August. I am glad to know you have been promoted from the ranks of scholars to shoulder straps in the domanie’s staff. There is nothing like promotion in this world if it nothing more than from a course hand dirt shoveler to a boss over Irishmen on the railroad. So keep moving up. I should not be surprised if you were promoted to the pulpit in a short time. The sheet is nearly full and I will close by sending respects. Your brother, Jas. M. Young. ¹ Sgt. Young nearly had the name correct. It was Confederate General Thomas Fenwick Drayton. 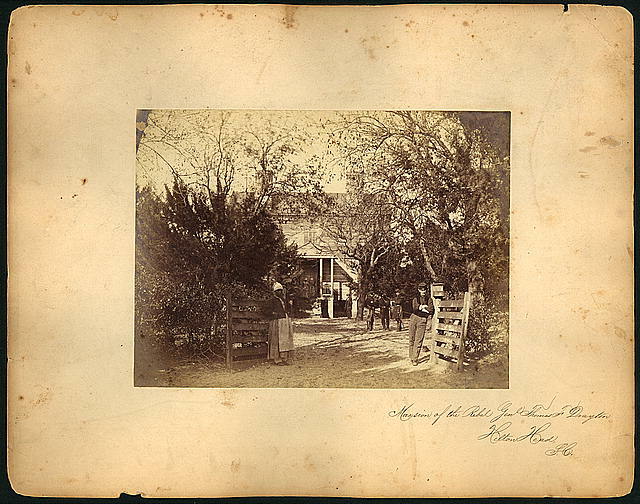 Drayton came into possession of Fish Hall Plantation on Hilton Head Island by marrying his wife, Catherine Pope. Tasked by Jefferson Davis to defend the island in 1861, Drayton used the mansion house as his headquarters and put many of his own slaves to work building the fortifications on the island. After the island fell to union troops late in 1861, Drayton evacuated his plantation and never recovered it. Your letter came to hand by last mail which I hardly expected as I write you so short a one the last time, but nevertheless it added to the cup of pleasure. About the matter concerning the regiment you probably know as much as I do — I knowing nothing definite, but presume as near as I can learn it will be satisfactorily adjusted and we get our pay. ¹ As yet we have received nothing from the government since leaving Fonda. When I receive it, I intend sending nearly the whole of it home to be disposed of by them as they see fit. Relative to the notes, I have left them in your care, and presume you will do everything in your power to collect them. How long a time is the note from Clark given for? I supposed Ike would have paid the whole ‘ere this as he promised me. If you ever collect it and want to use it, do so, and I won’t complain. That portion Ike is to pay you may have if you can get it for the trouble you have taken in the matter. The note from Clark is good, but no doubt will be slow. I received your letters and three papers by this mail, which kept me in reading matter for a show time. One letter was from home, one from Staff Mosher, one from Harrison Briggs, 102nd Regiment, and your own. Your paper also came to hand and two from Soney. It seems curious Soney don’t write. He hain’t written me but one letter since entering the service, and that I answered. I would like to receive a letter from each one of the family every mail, and even if I didn’t answer them all by return mail they shouldn’t complain as I probably write more letters than all of you together. I calculate to write you one and one home by every mail. I wrote Uncle Daniel the other day for the first time, giving him a brief history of the regiment since entering the service. We are making arrangements for a band in the regiment, and I think there will be no difficulty in getting up one. We have the players and all we need is the horns and a little practice. I hope it will be successful as there is nothing like music to charm the soldier’s heart. Regarding the watch, I do not care to say anything that will make it a bone of contention. Better it be broken to pieces. You say you had it and sent it home. That is evident proof you had possession of itm but I understood you to say you did not care to carry it in Fonda, and so left it home. For heaven’s sake, don’t have a wrangle about it. This part of the world continues to wag as usual and I keep on the “even tenor of my ways.” I am fat, rugged and healthy, nearly as black as Sambo, with no prospects of any kind of sickness or disease. Soldiering agrees with me tip=top and I am contented and happy as long as I can get anything to eat. It is 7 months ago the 8th of this month since I enlisted, and during that time I have seen three or four sick days and that was at Chicago. No change of climate seems to affect me. Fruit trees have been in blossom some time, peas, corn, and potatoes up nicely, so you see there is a vast difference this section and York State. Write by return mail. Respects to all. I did not intend to write by this steamer as I received neither letter or paper from you, home, or anyone else, and I felt a little provoked although I don’t know why I should; but I saw Lieut. [Willet] Ferguson just now and he kindly offered to take anything to you or bring anything back to me so I thought I would write you and keep you out of “hot water” as regards me. I have been thinking what I could gather to send you but as I look around I see nothing that would interest you. I might send you a specimen of South Carolina fleas but then I am afraid it would be the means of infesting your section with the “varmunts.” The ring I promised you some time since will be forwarded. This ring, as I said before, is made of crab root from Key West, Florida. The shells I suppose you got all right. I should like to know what they think of them. Whether they are worthy to be called a present or not. It is very warm today and it draws forth the sweat copiously. I suppose the heat wil increase as the summer advances but then we must get accustomed to it. Furloughs are being granted in this department now, and “in the course of human events” I expect to get one. I would like to get [out] of this hot place if it is only for a short time.